May 8, 2018 - by benign0 - 4 Comments. Calling for a laban or “fight” is easy. You can see how easy it is by observing any schoolyard brawl. Robredo uses an old-fashioned (though, to be fair, still-effective) technique of mass persuasion used by demagogues of yore. The fornmula is structurally the very same sort of call-to-action issued by popes and imams to launch their crusades and jihads. Whether it’s one “holy city” or the other or the name of one prophet or messiah being used in vain, the “victims” that one is called to “fight” for are often abstract or anointed with some sort of summary hallowedness that resonates with a people who would rather believe stories than think through factual options. This is the intellectual cancer that the Philippine Opposition under the leadership of the Liberal Party (a.k.a. the Yellowtards) continues to infest the nation’s politics with. Rather than encourage intellectual debate, the Yellowtards continue to stunt and poison Filipinos’ minds with the same cult of personality influence peddling around which they define their angels and demons. So, in the minds of the Yellowtards, the angels are those who live in the “heaven” of the perverse liberalism they espouse, and the demons live in the “hell” of the annoying rules that are now working against their agenda. What Robredo and her minions are waging their “crusades” over are mere business-as-usual initiatives any government worth their salt would pursue — like sanctioning businesses such as Rappler for baldly violating regulation, throwing in prison “senators” under whose watch as a former Justice Secretary drug use, trafficking, and administrative abuse proliferated in state correction facilities, revoking concessions given to “reporters” as a result of their employers’ business compliance offenses, and removing “chief justices” who are clearly not qualified to head the judiciary. That’s just plain old good housekeeping — something the shrillest of the shills who pass themselves off as the Opposition’s foremost “thought leaders” should understand at heart. Truth be told, the Opposition has not much intellectual capital to build strong counterarguments upon. Their old voodoo platform of worshipping faces on 500-peso bills had been massively discredited in the 2016 elections. They are now hard-pressed to craft a new alternative pathway to the “strongman” rhetoric of the administration of Philippine President Rodrigo Duterte that continues to be popular with millions of Filipinos. Suffice to say, the Opposition have not stepped up to meet that higher challenge and are, instead, waging a reactive intellectually-impoverished guerrilla war. Indeed, guerrilla wars are romantic subjects for SOB-story “inspirational” dramas. Some may even argue that the commies won the Vietnam War using guerrilla tactics. But, see, Filipinos are not like the Vietnamese and the guerrilla cause their current Opposition are desperately recruiting for exists only in the confused minds of “opposition” leaders like Leni Robredo. What is ironic is it is the very “influencers” of this “opposition” that continuously whine about the “weaponisation” of technology for political ends. We can understand where this mentality comes from now when we behold the absolute primitive approach they take in their political movements. This is, after all, the 21st Century and it is pretty evident that the playing field has changed thanks to the very technology that these liberals once heralded as, well, “game-changing”. Funny how the more clever use of these technologies by their opponents so easily knocked the wind out of all that gushing about the new “citizen journalism”. We can see here how every word uttered by Leni Robredo reveals the intellectual bankruptcy of the Opposition she presumes to lead. The solution is therefore obvious. 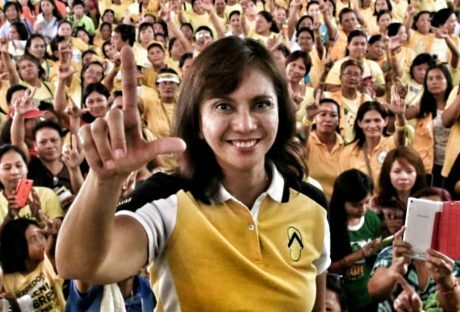 The Opposition need to ditch Robredo and, along with her, any trace of influence coming from the Yellowtards her face, form, and vacuous substance represents. The clock is ticking towards the 2019 elections and, soon, the next change in leadership. It is not too late for a real Opposition to emerge — if the obvious solution is considered, that is. Leni Robredo, was not elected by any mandate by the Filipino people, as she claimed. She was put there in the Vice Presidency, thru the SMARTMATIC HOCUS PCOS Machine. As ordered by the Aquino Cojuangco political axis, and thru the cheating of former COMELEC Chief , Andres Bautista. Andres Bautista, is now enjoying his billion pesos loots abroad. Robredo is a Fake Vice President, not even accepted by the Filipino people. There is no honesty in any bone of her body…. She has no shame. She is just a puppet of the Aquino Cojuangco political axis, the feudal oligarchs and the Liberal Party. If Leni Robredo, really knows the law. The crook . Chief Justice Lourdes Sereno; did not declare her true SALN, and cheated the government in her payment of taxes. This is nothing to do, with fighting for the Constitution. The Qou Warranto , filed against Lourdes Sereno, is now removing her, as Chief Justice of the supreme Court. By doing this so called: “Laban fight”; any liar and tax evader, can just seek cover in the Constitution, so as not to be prosecuted. Robredo stated: “we will not go silently into the night.” The election recount is full of crookedness/maliciousness… Ballot boxes destroyed; ballots immersed in water, with grasses on them; ballots poured with acids; dead people voted in Camarines Sur; voters’ audit logs missing; etc….Indeed, Leni Robredo will not go silently into the night. She had to do something , to salvage her fake position as Fake Vice President. She will go down in Philippine history, as the most hated woman politician…this will be her legacy. We have to enforce the law. No one is above the law. Those who corrupted the election process, must be prosecuted, in the Court of Law…The cheaters , liars and corrupt, must pay for their crimes. I can’t hep but wonder why is she fighting for CJ Sereno when she herself is not even sure about the legitimacy of her position. Being a “vice president” what power can she display when the executive branch is independent from its judicial counterpart. She is barking at the wrong tree! Most unintelligent or foolish people do not regard themselves as that; they regard themselves as not-that-intelligent or not-that-wise. The so-called “VP” Maria Leonor “Leni” Gerona Robredo is one good example. The Yellows do not need to ditch Robredo. They need to ditch themselves and Leni will follow for where else will a jellyfish go except where the tide flows. And Leni is nothing more than a jellyfish. Take away the tide and she stagnates and simply self-destructs.